This is truly a backyard enterprise. We made one for ourselves and friends requested them. 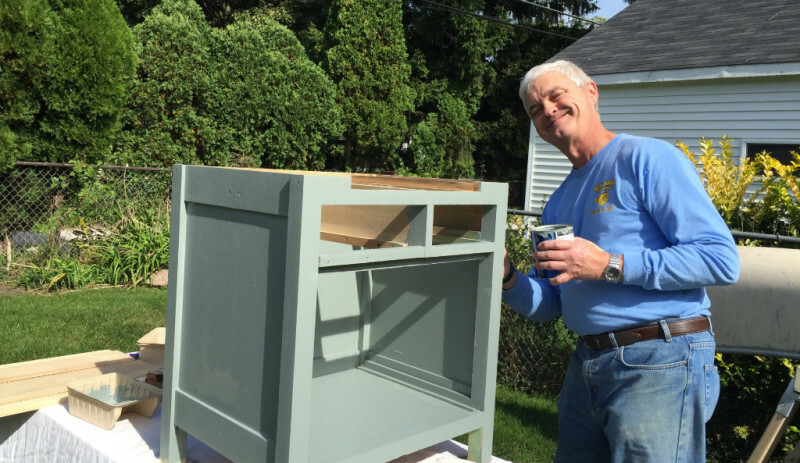 Now we are gathering old cabinets from wonderful non-profit suppliers and repurposing the cabinets into functional cabinets to hide cat litter boxes. It is a family project and while the dogs really don't pitch-in .... they do keep us company outside. You will note Sparkie the Cat will sometimes model when she chooses to do so. We rescued Sparkie at six weeks when my son and his friend found her at the park a few years ago. Sparkie needed some friends so she agreed to help foster two dogs. The 'fostering' lasted less than two minutes and the dogs are now ours. To thank the animal rescues that help spay, neuter and find homeless animals new homes -- we donate our time and enthusiasm for upcycling. All checks for these cabinets go directly to the animal rescue of your choice. If you are interested in a cabinet -- tell us the space, style and color and we'll make one for you! Allison, Larry, Will, Sparkie and the dogs ... Thelma & Louise and of course foster pup Roscoe! If you want to start your own projects ... let us know if you need tips. Our friend Teri on the east coast is going to start upcycling for animals too!